One person’s awe is another person’s boredom. Clearly not what the director was looking for and, by all accounts, not a true story. But what if John Wayne had never experienced awe? How would he know how to express it? New research is showing the benefits of experiencing awe—that sensation that’s created when we feel a sense of vastness as we contemplate something literally or symbolically bigger than ourselves. Often, it is a stunning landscape, but it can be almost anything, including an outstanding performance or a great work of art. You might be awestruck by the view right in your own backyard, which for me is the Housatonic River in western Massachusetts. The peace and beauty of the river create even more awe in me because this is a river previously associated with poison and contamination caused by man. Another source of awe might be the sheer power of nature. 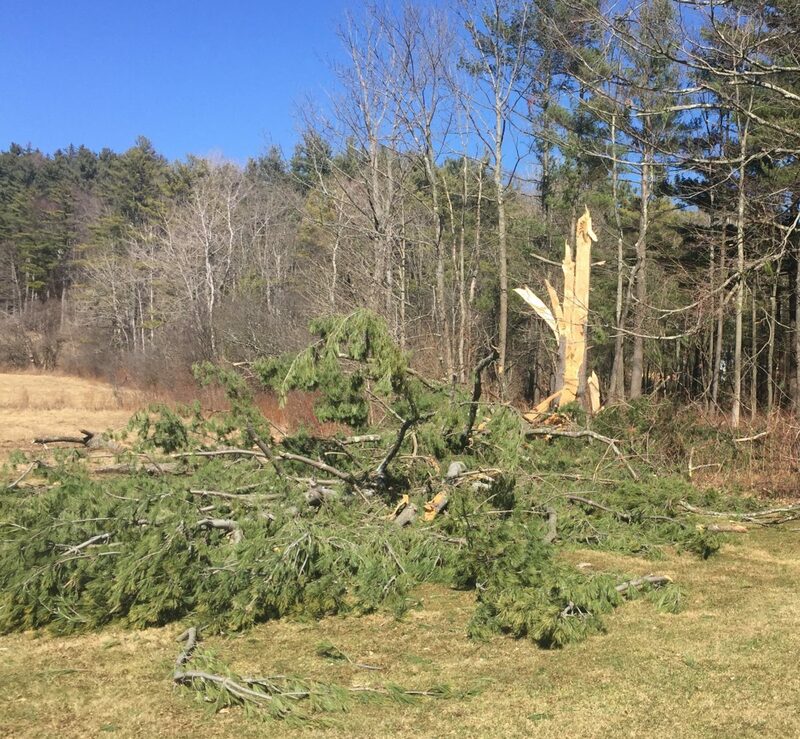 The feature picture for this post is a tree close to my home that was struck by lightning and was literally blown apart from the middle. Even so, the tender shoots of the tree kept blooming, and the trunk is sturdy and rooted in the ground—it epitomizes resilience. This tree occupied my attention on many walks—to the point that my dog, Milo, learned to stop for the inevitable tree exploration, patiently waiting in the shade of the detached branches. And then, contrast the power of nature with its delicacy. These frost patterns, while the sign of a particularly brutal winter in the Northeast, nevertheless cause awe in me with their delicacy, intricacy, and perfect geometry. My guest at the historic house told me that he feels awe when he reads about a new scientific discovery or experiences a particularly exhilarating ski run in France. After awe, researchers say, comes a process of mental adjustment called accommodation, originally proposed by psychologist Jean Piaget. He suggested that, when we are presented with novel and challenging information, new input that challenges what and how we view the world, we literally rearrange our thinking. When we experience awe, our minds need to make room for the onslaught of information that comes at us, and that accommodation helps us to be more creative and curious and to see things in a different way. Recent preliminary studies suggest that this change causes some pretty mind-blowing effects. For example, the experience of awe expands our sense of time by helping us to focus on the moment and be more mindful; it helps us to be more discriminating and weigh evidence more carefully; and it helps us to focus our attention outwards, toward collective goals and community instead of ourselves. What experiences have you had that inspired awe in you? Do you have photos, or can you find something online to act as a reminder? To get you started, watch this four-minute video taken at Yosemite. About two minutes in, it gets really awe-inspiring! Then see where you can find awe in your world, every day. Vision ~ Workplaces that integrate work life & "other" life to create thriving environments. Mission ~ To empower PMs to be the lynchpins of successful organizations & the key to team engagement as they create thriving workplace communities! To help overcome anxiety & stress in the workplace. My passion is to facilitate meaningful & socially valuable change through the engagement & empowerment of team members as a group & as individuals. I have 20+ yrs of experience in complex project management & team-building. In addition to project management skills, I integrate positive psychology, the law, economics & mediation practices into project management & team building. It is hard to be engaged at work if you are anxious or stressed, so I also coach those with anxiety & depression to THRIVE. Having worked in industries ranging from investment banks to retirement services companies & state government to organizations focused on wellbeing & mental health, I have breadth & depth of knowledge. I am energetic (zesty), curious & fair. I express my gratitude & appreciation. I use judgment & my love of learning to continuously improve. I appreciate the strengths of those around me & am a strong believer in playing to strengths. As a lover of books, learning and writing, I am excited that "Be a Project Motivator: Unlock the Secrets of Strengths-based Project Management" - will be published by Berrett-Koehler in Fall 2018. This book is for project managers who want to learn straightforward ways to become more engaged & motivated as well as how to engage & motivate others. The Hidden Power of Awe.